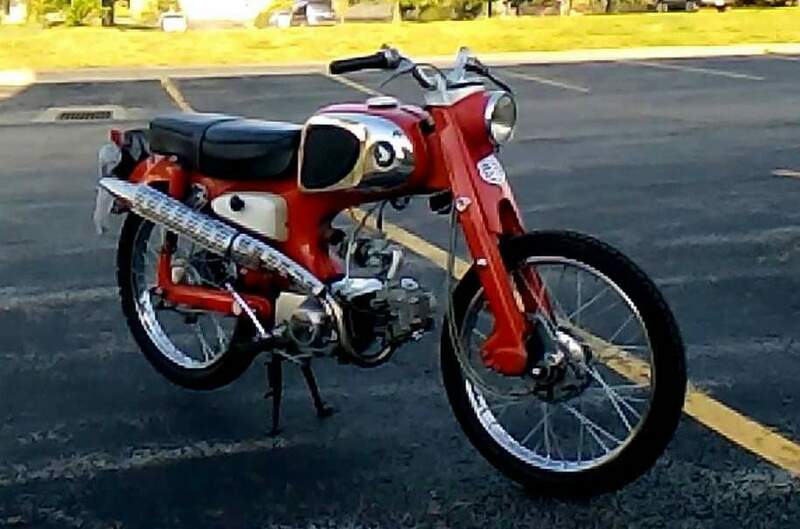 The Honda C110 Super Sports Cub, a 49cc motor motivated the sporty machine and helped to propel Honda toward a future of superior performance at every level. The Honda Super Cub is a Honda underbone motorcycle with a four stroke single cylinder engine ranging in displacement from 49 to 109 cc (3.0 to 6.7 cu in). In continuous manufacture since 1958 with production surpassing 60 million in 2008, the Super Cub is the most produced motor vehicle* in history. Variants include the C100, C50, C70, C90, C100EX and C70 Passport. The idea for a new 50-cubic-centimetre (3.1 cu in) motorcycle was conceived in 1956, when Honda Motor's Soichiro Honda and Takeo Fujisawa toured Germany and witnessed the popularity of mopeds and lightweight motorcycles. Soichiro Honda was primarily the engineering and production leader of the company, always with an eye towards winning on the racetrack, while his close partner Fujisawa was the man of finance and business, heading up sales and formulating strategies intended to dominate markets and utterly destroy Honda Motor's competitors. Fujisawa had been thinking about a long term expansion strategy, and unlike other Japanese companies, they did not want to simply boost production to cash in on the recent economic boom in Japan. A small, high performance motorcycle was central to his plans. Upwardly mobile consumers in postwar Europe typically went from a bicycle to a clip on engine, then bought a scooter, then a bubble car, and then a small car and onwards. Fujisawa saw that a motorcycle did not fit in this pattern for the average person, and he saw an opportunity to change that Soichiro Honda was at the time tired of listening to Fujisawa talk about his new motorcycle idea; Honda came to Europe to win the Isle of Man TT race and wanted to think about little else. Fujisawa and Honda visited Kreidler and Lambretta showrooms, as well as others, researching the kind of motorcycle Fujisawa had in mind. Fujisawa said the designs had "no future" and would not sell well. His concept was a two wheeler for everyman, one that would appeal to both developed and developing countries, urban and rural. The new motorcycle needed to be technologically simple to survive in places without up to date know how and access to advanced tools or reliable spare parts supplies. The common consumer complaints of noise, poor reliability, especially in the electrics, and general difficulty of use would have to be addressed. Because Honda was a large company growing larger, it needed a mass appeal product that could be produced on an enormous scale. The design had to be sorted out before production began, because it would be too costly to fix problems in the vast numbers that were to be manufactured. The scooter type nearly fitted the bill, but was too complex for developing countries to maintain, and the small wheels did poorly on badly maintained or nonexistent roads. Another of Fujusawa's requirements was that it could be ridden with one hand while carrying a tray of soba noodles, saying to Honda, "If you can design a small motorcycle, say 50 cc with a cover to hide the engine and hoses and wires inside, I can sell it. I don't know how many soba noodle shops there are in Japan, but I bet you that every shop will want one for deliveries." Once interested, Soichiro Honda began developing the Super Cub on his return to Japan. The following year Honda displayed a mockup to Fujisawa that finally matched what he had in mind, Fujisawa declaring the annual sales would be 30,000 per month, half again as many as the entire monthly two-wheeler market in Japan. His goal was to export motorcycles on a scale yet unseen in the economic disorder of postwar Japan, when most companies' halting trade efforts were handled through foreign trading companies. Honda would have to establish its own overseas subsidiary to provide the necessary service and spare parts distribution in a large country like the United States. To this end American Honda Motor Company was founded in 1959. In 1961 a sales network was established in Germany, then in Belgium and the UK in 1962, and then France in 1964. The Honda Juno had been the first scooter to use polyester resin, or fiberglass reinforced plastic (FRP), bodywork, and even though production of the Juno had stopped in 1954 as a result of Honda Motor's financial and labor problems at the time, Fujisawa continued to encourage research in polyester resin casting techniques, and these efforts bore fruit for the Super Cub. The new motorcycle's fairing would be polyethylene, the most widely used plastic, which reduced weight over FRP, but Honda's supplier had never made such a large die cast before, so the die had to be provided by Honda. The Super Cub was the first motorcycle ever to use a plastic fairing. Motorcycling historian Clement Salvadori wrote that the plastic front fender and leg shields were, "perhaps the Cub's greatest contribution; plastic did the job just as well as metal at considerably lower cost." 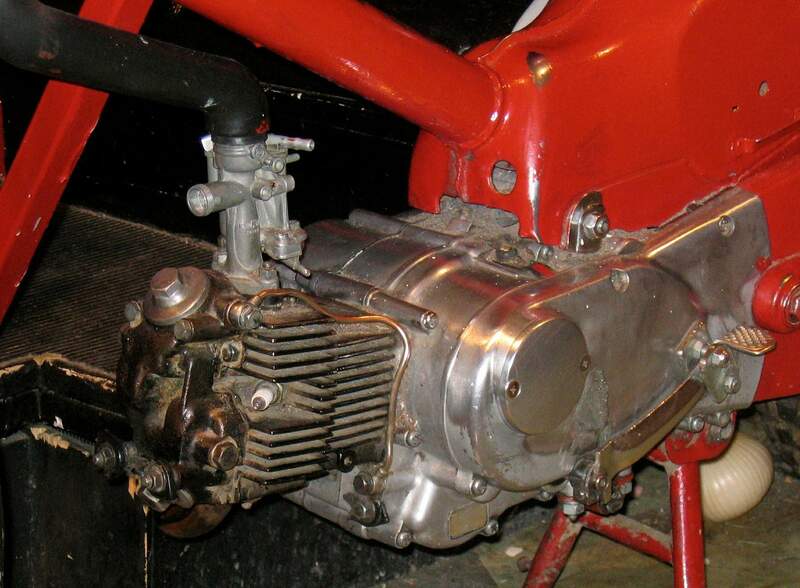 The technology developed in the Isle of Man TT racing program was equally vital to the new lightweight motorcycle, making possible 3.4 kilowatts (4.5 hp) from a 50 cc four-stroke Honda engine, where the first engine the company built a decade earlier, a "fairly exact copy" of the 50 cc two stroke war-surplus Tohatsu engine Honda had been selling as motorized bicycle auxiliary engine, had only a 0.37–0.75 kilowatts (0.5–1 hp) output Honda's first four stroke, the 1951 E-type, had just a little more power than the Super Cub, 3.7 kilowatts (5 bhp), with nearly triple the displacement, 146 cc (8.9 cu in). 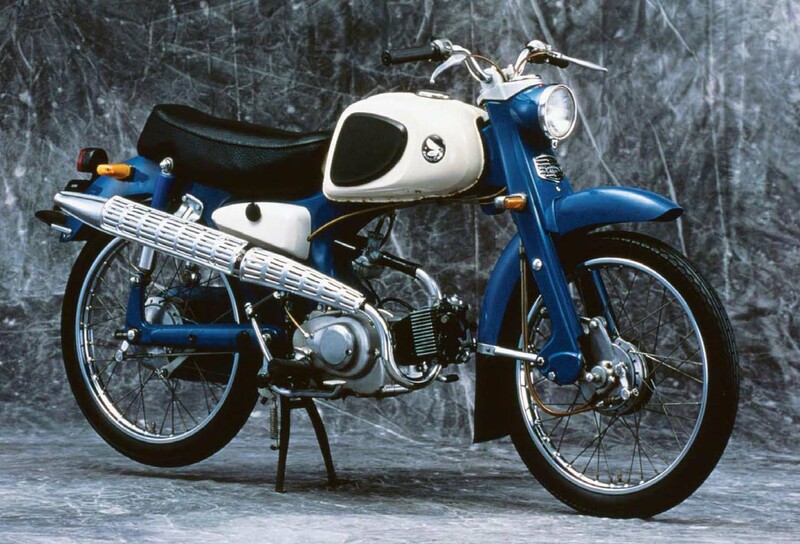 To make the new motorcycle, Honda built a new ¥10 billion factory in Suzuka, Mie to manufacture 30,000, and with two shifts, 50,000, Super Cubs per month.The factory was modeled on the Volkswagen Beetle production line in Wolfsburg, Germany. Until then, Honda's top models had sold only 2,000 to 3,000 per month, and observers thought the cost of the new plant too risky an expenditure. Edward Turner of BSA went to Japan to see the motorcycle industry in September 1960, and said that investments the size of the Suzuka plant were "extremely dangerous" because the US motorcycle market was already saturated. When completed in 1960, the Suzuka Factory was the largest motorcycle factory in the world, and was a model for Honda's mass production facilities of the future. The economies of scale achieved at Suzuka cut 18% from the cost of producing each Super Cub when Suzuka could be ran at full capacity, but in the short term Honda faced excess inventory problems when the new factory went into operation before the full sales and distribution network was in place.